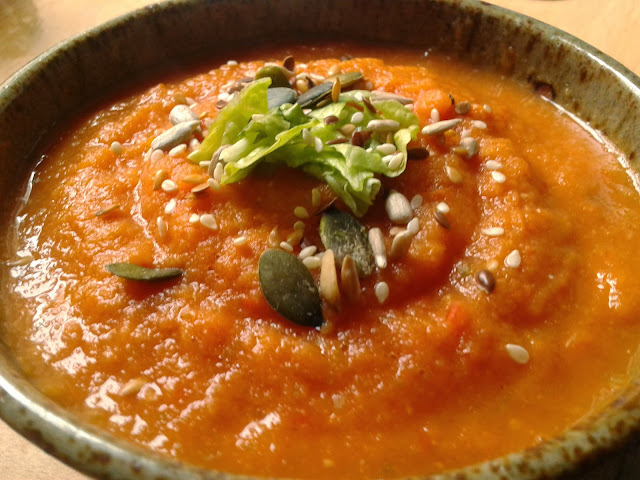 The humble and effortlessly healthy tomato soup is given a kick with the rich flavour of roasted fresh tomatoes, lettuce and garlic. I haven't added any chilli / scotch bonnet to this recipe because I wanted to keep things light and make the fresh tomatoes the star of the dish, but feel free to add some if you want a bit more heat. Aside from the long cooking time, it's incredibly easy to make and freezes well too. 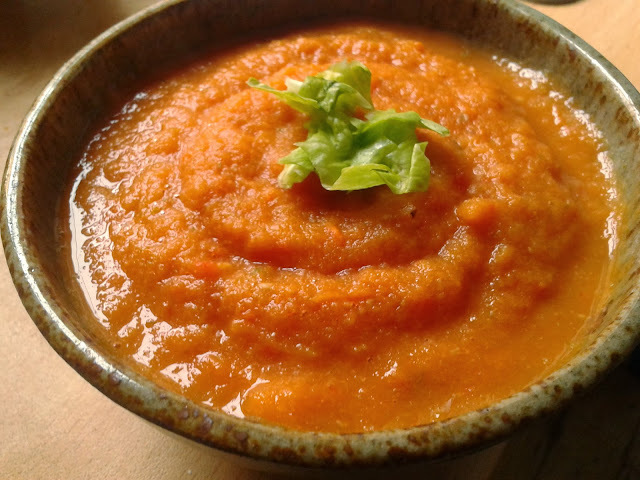 Tomato soup isn't something I make very often but I have it in mind to rustle up a big batch and store in the freezer for days when I want something quick and simple, or when I don't feel like cooking from scratch. Serves one if you're having it as a meal all to yourself; serves two if you're dishing it up in starter portion sizes. 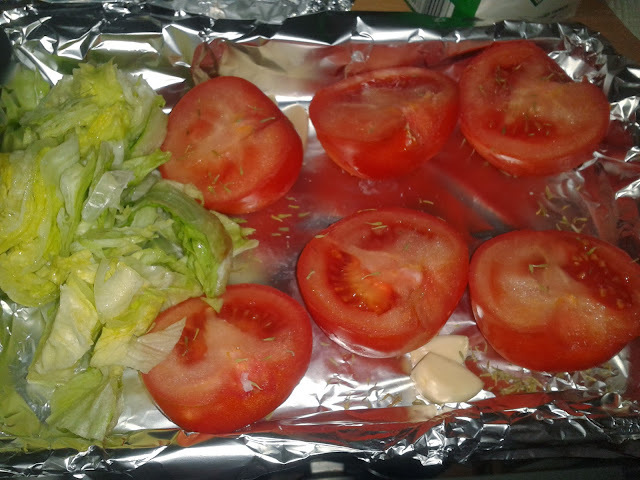 Line a baking tray with some foil and place your garlic and tomato halves (facing upwards) in it. Drizzle the tomatoes with a little olive oil, sprinkle on some dried thyme and season with salt and pepper. Roast in a pre-heated oven, gas mark 7, for 45 mins. Add the shredded lettuce to the baking tray 15 mins before the end of the cooking time (you want them to have a nice roasted flavour, not a burnt one). By the end of 45 mins, the tomatoes should be succulent on the inside and slightly crispy on the outside. Place the roasted lettuce, tomatoes and garlic in a food blender and whiz until smooth. You can take the skins of the tomatoes before blending to get an even smoother consistency, but I kept them on for the extra fibre. Check the soup for seasoning and add some extra salt or pepper if needed. Serve hot with a garnish of your choice. Nah wetin I go chop am with? Pounded yam? Garri? Yummy Recipe!!! Great blog nice n useful information, it is very helpful for me, I really appreciate thanks for sharing. I would like to read more information thanks.